Looking beautiful for many years to come..
As with all wood products, your wood floor will need a little care and attention to guarantee it will look its best for many years to come. Your wood floor is a natural product, which should look beautiful for many years to come. Its appearance will mellow and improve with age. It must, however, be properly cared for and the purpose of this leaflet is to provide you with the necessary instructions for looking after your floor. Like any form of floor covering, a wooden floor must be regularly cleaned and maintained in accordance with certain rules. It is a natural product and therefore vulnerable to misuse, but will reward regular care and attention. All manufacturers recommend an effective doormat to stop dirt and grit being transferred to your floor. Although the floor finish is tough, to minimise the chance of scratching, it is recommended that outdoor shoes are not worn inside the house and pets nails are kept clipped. Stiletto heels can also damage wood floors so it is recommended these are not worn on the floors. You will need felt pads to stick to the underside of your furniture and it is also strongly recommended that they are stuck to the bottom of all furniture that will come into contact with the floors. Avoid dragging furniture as this could cause damage to your floor and cause unsightly scratches. Never pour water over the floor as this could cause movement in the planks and make sure when mopping you only use a damp mop and wring it out thoroughly. If water is spilt on the floor make sure you clean it up immediately otherwise it could seep into the wood causing discolouration or movement in the planks. If floors are neglected it is expected that they will deteriorate and in effect, eventually be ruined. We do not take responsibility for any floors that are damaged due to poor care. Natural wooden floors should only be cleaned with Wooden Floor Soap diluted with water. Use a cloth that is designated to this task. Avoid cloths with micro fibres as this will make the surface raw. 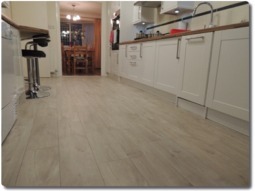 After the installation of the floor, be sure to remove all dust and to wipe with a wooden floor soap mixture, this is to be completed by the customer as it takes several days for the dust to settle. Do not wipe the floor with clean water alone. For the first few weeks the floor should be wiped every day with the wooden floor soap mixed with water. Normal cleaning can be done by vacuuming, sweeping or mopping. Any wet mopping or wiping should be done with a wooden floor soap. When cleaning dirty floors, it is important to avoid scrubbing as excessive scrubbing could strip the floors of their natural oils. Wipe the floors with a moist cloth as usual and avoid repeat washing. If after one year your floor is looking tired, treat it to an intensive conditioning treatment to reinstall its natural oils. Stubborn dirt can be removed by applying an Intensive Cleaner with an abrasive sponge. After the floor is completely dry, apply a thin coating of conditioning oil. Please read the instruction on the bottle carefully before applying. Lacquered wood floors should be cleaned as often as necessary with a wax mop or a solvent based cleaner. This can be applied using a damp mop. Make sure you do not apply too much water to the wood floor and avoid scrubbing the floor. To remove stubborn marks rub with a soft cloth individually with the floor cleaner. Never wet mop the wood floors as puddles could seep behind the baseboards and under the floor. Make sure you always vacuum and then damp mop. Never apply wax or acrylic wood floor finishes to laminate floors. Never clean any wood floors with abrasives, scouring powder or steel wool. Take common-sense precautions to protect your floor when working with sharp or heavy objects.